The duality of classical semiotics determines the basis of Western modern "representation" theory to a certain extent. In modern times, representation has gradually been dominated by ethnography and political discourse. Similarly, the disappearance of the "aura" suggested by Benjamin is also closely related to the display politics since modern times. The exhibition and worship of altar paintings (videos) is also an inter-relational process. Benjamin sums up the whole history of art into a process of the change from the value of worship to the value of exhibition, and art is changing from ritual-based to political-based. Under the conditions of contemporary exhibitions, a new value of worship has emerged. The display of artistic works, through the glass windows, fences and large-scale security that trigger the sense of distance and invisibility, has brought back the ancient values of worship. Art works are often worshipped while being exhibited. Thus, the contemporary value of viewing, “oscillates” (with the denotation of "shock" and "fluctuate") between the value of worship and the value of exhibition. In the context of new media art, contemporary video artists often present the whole of their works in a cross-media manner of video installations. They often construct the self-awareness of the video by means of dual-screen or multi-screen juxtaposition, re-creating frames, picture-in-picture and other techniques. The meaning is generated in the dynamic process of the video, and oscillates between different modes of representation. The meaning of the video works and video installations is swaying between different values or visual modes. Through studying the self-awareness of video in video works, this exhibition develops the discussion on display logic from the ontology of video media. 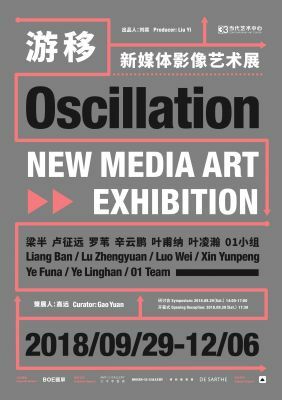 "Oscillation" is not an eclectic attitude, but a kind of vacillating value, a kind of "shock" and "fluctuation". It involves the motivation of the video language, the validity of the expression of ideas, and the reflection of the deep meaning of the video works.